It is difficult now to recall that, twenty years ago, Mute Swan was among the scarcest birds of Cheshire, with a special census in 1985 finding only 13 breeding pairs, and none in Wirral (Elphick 1985). The cause was simple to diagnose, and easy to remedy. Swans need gravel in their gizzard to grind their vegetable food, and amongst the small stones they were ingesting lead weights carelessly discarded, or lost, by anglers. The resulting poisoning killed many swans. Responsible fishermen voluntarily changed to non-toxic weights, and legislation banning the use of lead became effective on 1 January 1987. The Cheshire Swan Study Group (CSSG) was formed in 1988 and monitored the recovery of the population, topping 100 pairs in the county in 1996, and by the year 2000 the local numbers had outstripped the capacity of CSSG to cover the whole county (Cookson 1993, CWBRs). Even uninterested people find it hard to ignore Britain’s heaviest bird, and the Atlas map must be accurate. However, only 66% of occupied tetrads furnished proof of breeding, and about one-quarter of pairs—usually birds in their first year together—do not nest in any one year. Most swans first breed at three or four years old; a few females start at the age of two; but, especially when population levels are high and there is fierce competition for territories, some adults may never breed (Birkhead & Perrins 1986). Pairs normally stay together for life, with divorce being rare, but bereaved swans do find another mate, contrary to the romantic myth. Their population is probably limited only by the availability of suitable nesting sites. They have few natural predators, the size and fearless nature of the birds being sufficient to deter almost any attack, and their only significant threat is vandalism by hooligans throwing stones at the nest, destroying eggs and occasionally killing an adult. The habitat codes reported in this survey showed that 67% of our swan records are on standing waterbodies (G1–5), with 10% on flowing water (G6–8), 21% on canals (G9–10) and 1% on coastal water on the Dee. 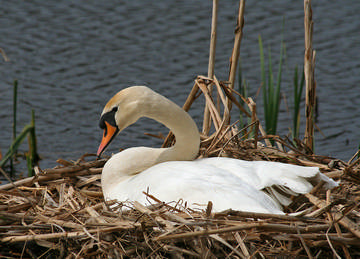 They are mostly on larger waters, as would be expected, but swans will nest on small ponds and narrow streams and ditches. Mute Swans eat almost any type of aquatic vegetation (to a metre deep), especially crowfoot, pondweeds and soft grasses. They will also graze on land, and occasionally take insects, molluscs and small amphibians, although it is not known if those are by choice or just because they were caught up in the submerged vegetation. If there is insufficient food for the chicks, adults will lead them, walking overland if necessary, to suitable water sometimes up to a kilometre distant, possibly into an adjacent tetrad. fowl’. What would he think now?